As regional councils progressively implement nutrient loss limits at farm and catchment level, farmers must think hard about how to reduce their nitrogen (N) leaching from grazing winter crops. Two Canterbury research trials have shown that using a catch crop can boost crop yield by between 6 and 12 tonnes of dry matter per hectare (t DM/ha), while reducing N leaching by up to 30 percent. The purpose of a catch crop is to cover fallow ground and take up the urinary N deposited during winter grazing, reducing the risk of nitrate leaching. To keep costs down, it’s important that the chosen catch crop increases DM produced on the same area of land. Two recent research projects, Forages for Reduced Nitrate Leaching (FRNL) and Pastoral 21 (P21), have shown DM production can be significantly increased at a lower cost per kg/DM, while decreasing the amount of leachable N. Both trials showed an oat crop planted after the grazed winter crop (kale) – any time from July 1 to August 31 – and harvested in mid- to late-November, yielded between 6 and 12t DM/ha on top of the winter crop yield. Table 1: P21 trial average costs and yields of crop-only and catch crop. The P21 trial showed the production cost was lower in cents/kg DM over three years when using a catch crop (refer to Table 1), compared to a winter crop only. Winter crops provide DM at a time when pasture is in short supply or is being spared for spring growth. Following the winter feeding of the forage crop, the land is then typically left fallow until a new crop is sown in mid-spring or returned to new pasture. Grazing of any winter crop contributes a large proportion of total N leached from the dairy operation. This is due to high crop yields (relative to pasture) leading to higher stocking densities at a time of year when leaching risk is greater. 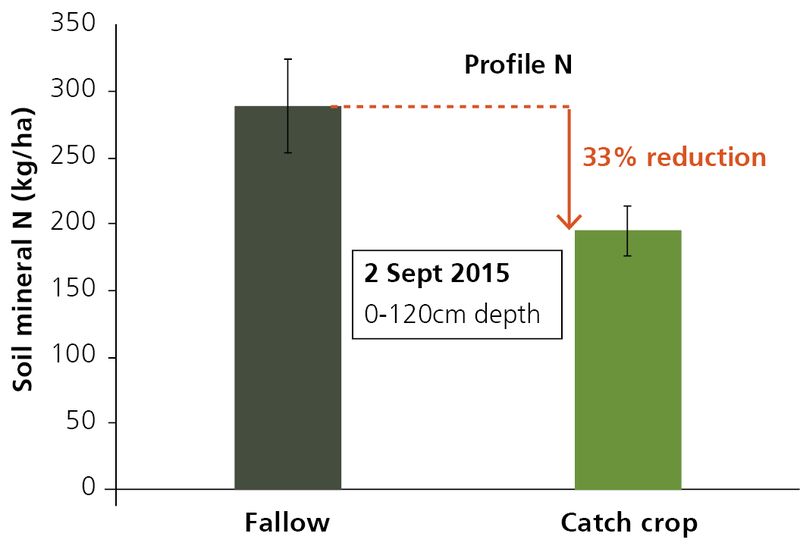 Both experiments have also shown that using a catch crop reduces N, compared to leaving ground fallow. The P21 study showed a reduction of 30 percent in N leached and the FRNL trial showed a reduction of 33 percent of soil mineral N (Figure 1). you’ll need a uniform seed bed for the catch crop, and this can be achieved by ensuring your previous crop is eaten, or leftover crop is ploughed in well.